When you add components or compile your project, the data on the installed license are added to the resources of your application. For that purpose, the licenses.licx file is created and included in the resources of your project. This licenses.licx file contains a list of the licensed components. 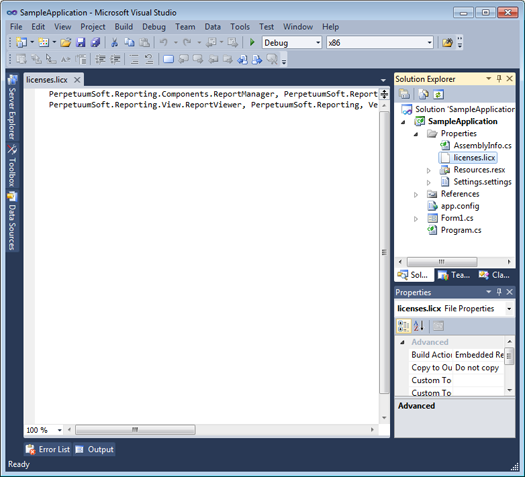 The license is being embedded in the project during the application compiling. And when you run your application on a machine where the license is not installed, the license will be taken from the resources of your application. It allows you to use your final application without installing the license on your end users machines. We strongly recommend that you make sure that the data on the license have been included into your project before your final application is distributed. To do that, please make sure that the licenses.licx file is created and included into the Properties folder of your application and that this file contains description of all types of the used components. Sometimes recompilation of the application does not cause recompilation of its resources. And it is possible that the licenses.licx file will not be created in some Integrated Development Environments (IDE). In this case, please do the following: make any minor changes on a form where the used components are located and recompile the application. These changes will force an IDE to recompile resources and refresh the licenses.licx file.